. The DVLA owe you a duty of care but they prefer to ignore this inconvenient fact. A carefully constructed argument about the lack of quality control and the allowing of an UNINTERESTED THIRD PARTY may at least get DR+ banned from accessing anyones details in the future. You have a case for suing DR+ for obtaining your details in breach of the KADOE agreement and processing it unlawfully ( passing them on) Knowing what the parking contract with LL says will determine if JD should also get the treatment. I cant find an ICO registration for JD parking consultants so you will have to make further enquiries as to whether they are actually allowed to process data. J D Parking Consultants Ltd ICO registration number- Z1617300. any prior notice that they intend to ask the DVLA for ones data. Like many situations not revolving around parking a third party may have rights to take action or enforce their interests but in this case DR+ said they were acting on behalf of the landowner as their agent and that is patently untrue. DR+may be the agent of PD but that doesnt automatically mean that they have the necessary permissions either. and then asking not only the parking co for evidence they are fulfilling the requirements of the Act an their agreement but asking the motorist if they believe the request showed reasonable cause. Now going on the usual stats 4 out of 5 wouldnt even get a response so it would be then necessary to consider carefully the 1 that did reply to the survey. Winning an appeal or even beating off a court claim doesnt automatically mean that the parking co were wrong to apply for the keeper data but there are many circumstances where it never would apply and if an appeal is won on procedural grounds the the parking co would be wrong even if on another occasion they got it right. 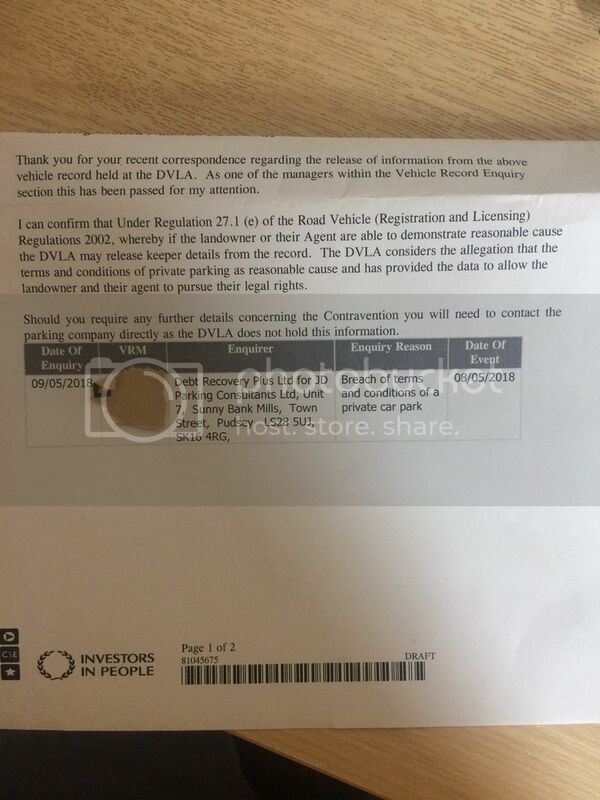 Certainly anyone who has been on this motoring Forum for a while knows that none of the major parking companies told the truth when they became members of the BPA or the IPC. Not a single one complies with all the requirements in order to be able to form a contract with motorists. This of course means that these crooks have no reasonable cause for asking for our data. Yet one gets the impression that the DVLA appears not to know. And it isn't as if it is a secret. Every week we see motorists having their ticket quashed because of failures by the parking companies to comply with the Law. the release of our data. Or they don't know about the lies in which case they are unfit to administer the release of our data. How the DVLA have got away with this for so long is amazing. They are an embarrassment. It is a reflection perhaps just how weak the controls are over the DVLA. DVLA will carry on regardless as they make money from the non GDPR Compliant relase of Keepe data. As a Quango they rgard themselves as beyond the law. Time they were tolchocked. Like other grand designs of governemnt they are too big to fail, they will ignore the law even when the ICO orders them to behave in a certain way. HMRC ad councils do it all the time, the NHS and govt ministers individually may get ordered by courts to take certain action but no-one sends them to prison for contempt of court. We'd all love to see that Paul.